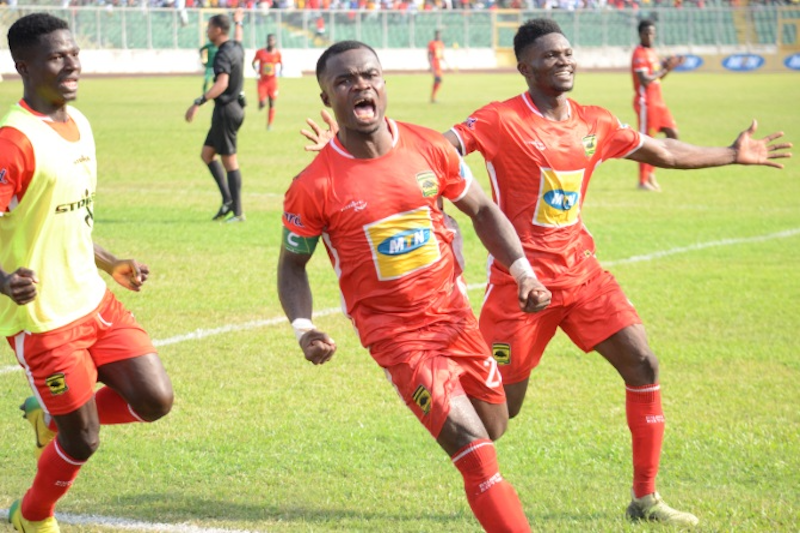 Kumasi Asante Kotoko have qualified to the group stages of the CAF Confederation Cup for the first time since 2008 after beating Cameroonian side Coton Sport 2-1 in Kumasi to complete a 5-3 aggregate victory. A first half penalty from captain Amos Frimpong and a Maxwell Baakoh effort in the second half gave the Porcupine Warriors a healthy 2-0 lead before Oumarou Sali scored the consolation for Coton Sport in the 86th minute. Kotoko were favored to go through following their 3-2 victory in Cameroon a week ago and they made their intentions clear from the start, calling the Coton Sport goalkeeper into action inside the first two minutes. First, he had to come off his line to clear from Abdul Fatawu’s lobbed effort before sweeping Maxwell Baakoh’s cross wide ahead of the on-rushing Songne Yacouba. When Yacouba toe poked a shot straight at the Coton goalkeeper Bassa Djeri after a beautiful one-two with Abdul Fatawu on 15th minute, that marked the last effort on goal from open play for the Porcupine Warriors in the first half. The Cameroonians appeared to have learned their lesson, remaining resolute when they don’t have the ball, and not over committing when they have it. Maxwell Baakoh’s trickery failed to provide any sort of spark as he was constantly hacked down every time he had the ball. Coton Sport were fully aware of the havoc he could wreak when afforded the opportunity following his fabulous display in Garoua 7 days ago. But on the stroke of half time, Kotoko got the breakthrough from the penalty spot. After Yacouba was brought down in the box by Ndongo Foe, captain Amos Frimpong stepped up to convert his second penalty of the qualifying campaign, planting the ball beyond Djeri. It was the perfect gift for the partisan crowd inside the Baba Yara stadium who until then, were beginning to feel frustrated at their team’s lack of clear cut chances. Kotoko doubled the lead right after recess. After Richard Senanu played a free-kick onto Baakoh, the former Wa All Stars spotted the Coton Sport goalkeeper off his line and fired absolute rocket into the net from a near impossible angle. As he ran to celebrate with a section of the fans, the atmosphere inside Baba Yara went into overdrive. Baakoh had now proven to be a nightmare for the Coton Sport defense after he also scored in the first leg. The second goal was the insurance Kotoko needed to settle their nerves and play their football and boy did they. Everything beautiful from Kotoko was orchestrated by Kwame Bonsu at the heart of midfield. Tricks, flicks, quick passing. This was the stuff CK Akonnor promised when he took the job. He promised to deliver brand of football nicknamed “Agoroball” and there were more than a few glimpses of it. But Kotoko almost seemed too comfortable just holding onto the ball without really threatening. It allowed Coton Sport into the game. And after Gueme Araina, goalscorer in the first leg, got the Cameroonians’ first shot on target in the 81st minute, Oumarou Sali made sure Kotoko paid for their complacency, scoring after being played through. It only amounted to consolation though as Kotoko went on to wrap up a 2-1 win and a 5-3 aggregate victory and secured passage into the group stages of the Confederation Cup for the first time since 2008. The two time African Champions are also guaranteed a $275,000 pay out for reaching the group stages. Kotoko will discover their group stage opponents in Monday’s draw.